CHAIRMAN: I had indicated, ladies and gentlemen, that before taking up the evidence of the two witnesses to be heard today, I would make a limited number of further remarks regarding the intended further course of the work of this Tribunal. It is undoubtedly the case that the period since we concluded our last substantial public sittings in November last has been a lengthy one, and the cost entailed in the work carried out in the interim considerable. But this has to be assessed in the context of what has transpired to be immeasurably the most complex and diffuse type of issue that has been undertaken at any stage by this Tribunal. It is not a money trail inquiry. It has involved dealing with very many potentially involved persons in at least six jurisdictions in an endeavour to reconstruct the many layers of what appears to have taken place at the various stages of the competition, ultimate award of licence, and related issues. Some approximately 75,000 pages of documentation has already been required to be considered by the Tribunal in the course of that exercise, and further material capable of changing the position has still continued to come in. Without cliche, this matter has transpired to be a Tribunal within a Tribunal. It is foursquare within our Terms of Reference, and it relates to what probably was as far-reaching and momentous a decision or series of decisions as has been taken by any Irish government in an administrative context. While some persons may seek to urge an immediate hearing, it must be remembered that there are considerable numbers of potentially involved persons over and above those most frequently mentioned in connection with this potential issue. They too are entitled to fair procedures. Consideration was given to making an earlier start a few months ago, but in retrospect, it would have been a mistake to have then embarked, and it would not have provided the sort of structured and coherent presentation of quite complex and convoluted evidence that the persons concerned, and indeed the public, are entitled to expect. I also feel that when the issues are taken up, the structured and coherent presentation that I have referred to will enable time to be saved in the presentation of the evidence in that orderly fashion. If the time that has been taken up to date in preparation has been to any degree excessive, the fault is mine and nobody else’s, because the legal team working with me here have worked exceedingly hard and conscientiously; and I believe the deferral, whilst lengthy, has been unavoidable to enable the toughest part of this Tribunal’s task to be undertaken professionally and adequately. With this in mind, it is my intention that the particular phase of the hearings related to these matters will be taken up at or immediately proximate to the start of the new legal year in October. There will be a detailed opening of what is entailed, and that will then be followed immediately by what will inevitably be quite lengthy evidence. It will be neither short nor easy, but it will be no longer than the minimum that I consider necessary to deal properly with the related topics involved. When I speculated with what may now seem to have been specious optimism during the portion of the evidence relating to Mr. Charles Haughey as to the likely time-frame of the Tribunal, it was in the belief then, held in good faith, that there would be comparatively little or nothing to be explored in regard to this intended phase of evidence. That has not transpired to be the case. ways, dispiritingly lengthy duration of this one can be avoided. Yet it is the case that experience in the course of this Tribunal has shown that it is by painstaking digging, rather than hunches or lightning flashes of inspiration, that a majority of important information is uncovered. After this intended aspect of evidence commencing in October, and some loose ends that remain from other evidence, have concluded, the Tribunal will return to certain matters by way of acts or decisions that pertain to Mr. Charles J. Haughey. Extensive work has been carried out on a number of these already. I will have regard, in taking up this aspect, to the age, state of health, and time-frame of the Tribunal in the context of Mr. Haughey’s circumstances, but I must nonetheless balance this with adequately addressing the particular Terms of Reference that may fall within our remit by way of any such acts or decisions. With this in mind, whilst I will not break the Tribunal practice of declining to reveal what may or may not have been done on foot of confidential investigations on any issue, I am prepared to accept that I should not take the approach of disqualifying myself simpliciter from dealing with any matter involving Cement Roadstone Holdings because of my previous and declared interest in that company. I say this with some care and some reluctance because of a number of factors including, (a), the representations made by counsel on behalf of the public interest and the Attorney General and the representations on behalf of senior representatives of political parties in the last Dail; (b), the fact that a certain amount of Cement Roadstone Holdings related work has in any event been undertaken in public sittings here; (c), the scarcely desirable course of yet another Tribunal of Inquiry being sought to be established, and (d), the fact that ongoing sittings in a lengthy inquisitional process in a small country such as this one have shown how hard it is for any Chairman to be entirely unacquainted with any person or entity who may crop up in the course of ongoing sittings. Nevertheless, I shall give anyone with locus standi who may incline to a different view on this aspect a chance to be heard, and I do reserve taking a position or view on any contingency that may arise if there seems to me to be an insurmountable conflict of duty and interest. Those, ladies and gentlemen, are the few brief remarks that I wish to make on our future intended course of dealings, and I will now ask counsel for the Tribunal to take up the two witnesses who have attended to testify today. MR. HEALY: Mr. Michael Lowry, please. CHAIRMAN: Thank you for your further attendance, Mr. Lowry. Please sit down. You are already sworn. MR. HEALY: Thank you, Mr. Lowry. The documents that were brought to your attention recently, Mr. Lowry, and upon which you were asked to comment, contain references to property transactions in England that the Tribunal has already examined, and you have already given evidence in relation to them, and they have been described earlier in evidence as the Cheadle and the Mansfield properties, and I take it you understand those distinctions. 1 Q. Now, in relation to the Cheadle property, I think the evidence you gave and the documentation that was made available to the Tribunal by you was to the effect that as far as you were concerned, you were not involved in that property after January 2000 when the guarantee arrangement with Mr. Daly fell through? 2 Q. And that from that time onwards, although you had purchased the property, Mr. Aidan Phelan was the person who was now the owner of it, and what is more, who was now going to be responsible for the loan to Woodchester; isn’t that right? 3 Q. I think you did say that you did regard yourself as honour-bound or morally bound to move the property on; is that right? 4 Q. Now, just so that we can understand the position regarding your dealings with Mr. Christopher Vaughan in connection with any of these properties, can you tell me what the current status of the Mansfield property is? A. The current status — the status of the Mansfield property since this Tribunal last sat or interviewed me is that I continue to retain 10 percent ownership of that particular property. The only thing that has happened in the interim is that at the request of Aidan Phelan, I agreed to sign over the ownership of that property in the name of Aidan Phelan, but I retain, obviously, my 10 percent. 5 Q. I see. When did Mr. Phelan ask you to do that? A. About, I would say, three or four months ago. 6 Q. Up to that time the property had been in your name? A. Yes, which was brought to the attention — which I gave in evidence, yes. 7 Q. Yes, you did you gave evidence of that. So up until three or four months ago, that property was definitely in your name; but as far as you were concerned, you were only entitled to 10 percent of it, and Mr. Aidan Phelan was entitled to 90 percent of it, on foot of I think what both of you described as a joint venture agreement; is that right? A. Yes. The involvement legally superseded the fact that it was registered in my name. 8 Q. And that joint venture agreement is still in effect, is it? A. Yes. 9 Q. Can you tell me, did Mr. Christopher Vaughan effect this change, or is he, or was he then, still the solicitor involved in dealing with the matter? A. My understanding is that Aidan Phelan has a different solicitor dealing with that; he has a solicitor in Manchester. I don’t know the name of the company. 10 Q. Well, is Mr. Christopher Vaughan still acting as your solicitor in relation to that property? A. My interest in that property continues to be the 20 percent which would be dealt with by the solicitor who was looking after the property itself, which is the solicitor in Manchester. 11 Q. So does that mean that all the papers in relation to that property went to the solicitor in Manchester at some point? A. I have no idea. Aidan Phelan was dealing with that matter. 12 Q. But I am sure you’ll understand, you must have had dealings with solicitors before; you can understand that I am surprised as to how a solicitor, Mr. Christopher Vaughan, could transfer the ownership of that property from your name into someone else’s name without your consent to do so. A. Sorry, I already stated that I was requested by Aidan Phelan, for efficiency reasons or whatever reasons, to transfer the property to his name as the 90 percent owner of it, and I agreed to do that; I agreed to do that. He made the arrangement, and I signed whatever documentation he sent to me. 13 Q. I understand. So did he ask you to do this by letter, or did he simply ring you up and ask you to do it? A. He rang me and then asked me — sent on the documentation. 14 Q. Well, did he ring you and say, “Look, I want to transfer this property into my name for”, as you say, “an efficiency reason”, or did he give some other reason? A. No, that’s the reason. 16 Q. What was the efficiency? Can you recall? A. I don’t — I didn’t ask him, obviously. I just agreed, and I said fine; I didn’t have a problem with that. 17 Q. And did he send you legal documents? 18 Q. Do you have those legal documents or copies of them yourself? A. Yes, I will have copies of them. 19 Q. And did you get any legal advice yourself in relation to signing those legal documents? A. No. It was a straightforward matter. There was a simple transfer of the ownership of the property, and the reason I agreed to do that is that he is the 90 percent shareholder in it, and from the documentation it’s clear that I retain my 10 percent, but he is simply the registered owner. That was the only change that was effective. 20 Q. At the time that Mr. Phelan asked you to do that, and at the time that he handed you those documents or — did he send them to you, or hand them to you? A. He sent them to me. 21 Q. Did you meet him face to face in relation to it? A. No, he just sent the documents to me. I signed them and sent them back. 22 Q. What solicitor was acting in relation to those matters from Mr. Phelan’s point of view at that stage? A. I don’t know the name of the company, I can’t recall, but I recall him telling me that it was a legal practice in Manchester, that he has a lot of other business dealings with it. 23 Q. I presume that you would have been fairly familiar with Mr. Christopher Vaughan’s headed notepaper, and it wasn’t his notepaper that was involved, in any case? 24 Q. So the matter had passed out of Mr. Christopher Vaughan’s hands. Did you have any direct dealings with Mr. Christopher Vaughan in relation to that? 25 Q. Do you recall whether any of the documentation that Mr. Phelan gave you included a direction to Mr. Vaughan to hand over any documents in the matter to some other firm of solicitors? A. Like, I don’t recall. 26 Q. Up until the time that this was done, a few months ago, what dealings had you had with Christopher Vaughan in connection with the Mansfield property? 27 Q. None whatsoever? Nothing had happened in relation to it? A. In recent times, no. 28 Q. Now, in relation to the Cheadle property, which you ceased to have anything to do with from January of 2000 when you divested yourself of your interest in it, can you tell me what further contact you had with Mr. Vaughan or with Mr. Aidan Phelan with a view to moving the property on since you last gave evidence? 30 Q. Have you done anything yourself with a view to moving the property on? A. No. I haven’t got involved, for the reason that in or around the same time that Aidan Phelan made the request to transfer the 90 percent, he said he had made progress on the Cheadle property and that he was dealing with it himself. 32 Q. I see. Up to the time that Aidan Phelan told you that, you had no — you had had no dealings with it either? 33 Q. And did he tell you that in the course of the telephone call he made to you asking you to transfer the Mansfield property into his name? 34 Q. But am I not right also in thinking that between the time in January 2000 when you divested yourself of any interest in that property, you gave evidence that you didn’t get actively involved in moving it on at all? A. I didn’t. I simply didn’t have the time. 35 Q. I appreciate that. You did say you felt you had a moral obligation, or at least Mr. Phelan did, but in any case you did nothing about it? 36 Q. And you had no dealings with Christopher Vaughan or Kevin Phelan about it? 37 Q. Was Mr. Christopher Vaughan dealing with any other property in England on your behalf or in the UK on your behalf, or any other property at all, I suppose I should say? A. Was Christopher Vaughan — no. 38 Q. Did you have any other property in England for which you were using some other solicitor? A. Yes. I have — I am involved in a property, as I informed the Tribunal, in Wigan. 39 Q. Is that the Vineacre property, or am I mixing it up with something else? 40 Q. Is there a totally different solicitor dealing with that? 41 Q. Nothing whatsoever to do with Mr. Vaughan; they would have had no connection to do with one another? A. Maybe originally they had. I can’t recall the time scale involved. Maybe originally Christopher Vaughan had, but certainly not in recent times and not now. 42 Q. Well, would I be right in thinking that at the time you ceased to have anything to do with the Cheadle property, Mr. Vaughan wasn’t dealing with the Vineacre property? A. I’d have to check my files on that; I am not quite sure. 43 Q. Can you remember when you bought the Vineacre property? A. I don’t — I don’t have the precise date. 44 Q. Can you remember roughly? A. It would have been I think around 2000. 46 Q. Can you remember if you had bought it, I think before you gave evidence the last time, which was in November of last year; isn’t that right? 47 Q. So do you remember if you bought it last year? A. I must have bought it last year, in or around that. When I say I bought it, I just have, again, a partnership. 48 Q. I appreciate that. It was bought last year, in any case. A. I don’t have the precise details of it, but I certainly can provide you with them. A. 10 percent in the Mansfield. 50 Q. In the Mansfield property; and after January of that year, you had no interest in the Cheadle property? 51 Q. And at the time that you acquired the Cheadle property, which was I think around December of 1999, the only other property you had in the UK was the Mansfield property? 52 Q. After you ceased to have anything to do with the Cheadle property, did you regard Christopher Vaughan no longer as your solicitor in relation to that matter and as your solicitor only in relation to the Mansfield property? A. Correct. 53 Q. You never formally instructed him or you never formally withdrew his instructions, as far as you can recall, in relation to the Mansfield property unless some document Mr. Phelan gave you directed that his instructions would be withdrawn; is that right? A. On the Cheadle one? A. I understand what you are saying. 56 Q. In relation to Mansfield, you got documents from Mr. Phelan. You don’t know whether they contained a withdrawal of instructions to Mr. Vaughan, but we can check that, obviously; we can look at the documents. 57 Q. Apart from anything you may have signed for Mr. Phelan, do you ever recall formally telling Mr. Vaughan yourself that you were withdrawing his instructions in relation to that property? 58 Q. In relation to the Cheadle property, did you have any direct contact with him telling him that you were no longer involved? A. What happened was Aidan Phelan notified him of that, and subsequent to that, probably within days or what have you, I recall getting a phone call from Christopher Vaughan telling me that Aidan Phelan had instructed him as such. 59 Q. I see. So as and from that time, you were satisfied that Aidan Phelan had instructed Mr. Vaughan that you weren’t involved and that Mr. Vaughan understood that? 60 Q. Can you remember roughly when that telephone conversation took place? A. I would say January/February. 62 Q. Did Mr. Phelan give you any reason for changing solicitors in relation to the Mansfield property to his new solicitors in Manchester? A. He didn’t. I just — he didn’t — I didn’t ask him for an explanation. He said that he was, for efficiency reasons, and he did mention the fact that he had a lot of business dealings with this firm in Manchester, and for that reason he was going to conduct his business through them. 63 Q. And so it wasn’t because he or you were unhappy with Mr. Vaughan in any way? A. I can only speak for myself. I wasn’t; whether he was or not, you have to put that question to him, but he didn’t indicate to me that he was. 64 Q. Have you had any contact with Kevin Phelan since Mr. Aidan Phelan wrote to you saying that he would now handle the Cheadle property on his own? 65 Q. Do you know whether Mr. Aidan Phelan contacted him to tell him that he was now going to handle the moving on of that property himself? 67 Q. In fact I am looking at leaf number 2, which is not the leaf on my book that pertains to you, but I think you have the same book as me? 68 Q. I think we have the same book. A. Are we talking about the letters? 69 Q. Yes, we are talking about the letters, yes. 70 Q. I think you may have the same letters in your own divider. 71 Q. I think you have, in fact. Now, the first document is document A. I just want to go through each one of the letters so that we have a way of describing them that we can agree on, so that there won’t be any confusion in any questions I have to ask you and answers you have to give me. Document A is, as you can see, an office copy of a letter that was apparently sent to Kevin Phelan on the 12th July, 2000. And you are familiar with that letter as a result of it having been brought to your attention by the Tribunal and from having been discussed with your solicitors? 72 Q. That letter was produced, I think, to the Tribunal by Mr. Kevin Phelan — by Mr. Christopher Vaughan, sorry. If you go to document B, document B is the top copy of that letter, document A, and that was produced to the Tribunal by Kevin Phelan, who was the addressee of the document. You understand that? 73 Q. So the solicitor would have sent, or so we understand, or the Tribunal was certainly led to believe, that document B was sent to Mr. Kevin Phelan by Mr. Vaughan, and document A was retained by Mr. Vaughan as his file copy. You understand that? 74 Q. Now, we have been calling that document, document B, the short form top copy of document B. And if you go to document C. This is the document that was made available to the Tribunal initially by Mr. Colm Keena. It’s again addressed to Mr. Kevin Phelan. Like the last document it’s dated 12th July, 2000. And again it’s about Saint Columba’s Church, and the two documents are similar except that in document C, there are two additional paragraphs, or there are at least changes in two paragraphs that don’t appear in document B. You understand that? 75 Q. And we have been calling document C the long form top copy of the letter of the 12th July, 2000, because it’s longer than the other one. I want to go through the same exercise in relation to the letter of the 5th September. Document D is the file copy retained by Mr. Vaughan of a letter which he wrote on the 5th September to Mr. Kevin Phelan. That document or a copy of that document was furnished to the Tribunal by Mr. Christopher Vaughan. The next document is a top copy of that office copy, which was furnished to the Tribunal by Mr. Kevin Phelan. It’s document E, and we are calling that the short form top copy of the letter of the 5th September 2000. If you go on to the next document, which is document F, the document that was provided to the Tribunal, or a copy of which was provided to the Tribunal by Mr. Colm Keena, that has been called the long form top copy of the letter of the 5th September, 2000. Now, on the 12th June this year, your solicitors, Messrs. Kelly Noone, wrote to Mr. Christopher Vaughan drawing his attention to queries that had been addressed to you concerning these documents. Do you have a copy of that letter? It’s document 26 in leaf 1. A. Back to the front? A. This is the letter that my solicitor sent to Christopher Vaughan? A. At the request of the Tribunal? 78 Q. Yes. Take your time. It’s numbered, on my leaf number 1, as document 26. A. Just give me a moment. 79 Q. Sure, take your time. 80 Q. Now, I don’t want to go into all the correspondence that Mr. Davis read into the record yesterday, but you’ll recall that that letter was written by your solicitors on foot of correspondence he had received from Mr. Davis? 81 Q. And just very briefly, because I want to refer to one or two parts of it, I think I should, in fairness to you, read out the whole letter. 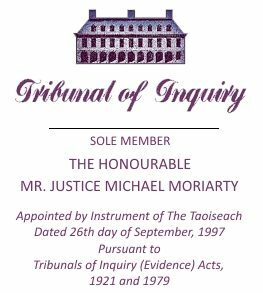 “We write to advise that we act on behalf of Mr. Michael Lowry in relation to matters under investigation by the Tribunal of Inquiry (Payments to Messrs. Charles Haughey and Michael Lowry). “Mr. John Davis, solicitor for the Tribunal, wrote to us on the 25th April and furnished with his letter copies of correspondence and communications with you, and amongst the documentation furnished provided us with copies of letters issued by you to Mr. Kevin Phelan, solicitor, dated 12th July and 5th September 2000. We have subsequently had a meeting with counsel for the Tribunal, and it has been made very clear to us that as you have not provided the Tribunal with a meaningful explanation for matters under inquiry, there is considerable potential for very negative conclusions affecting your conduct in the matter and as a direct consequence could unfairly impact on our client. “On Wednesday 25th July, 2001, Mr. Aidan Phelan gave evidence to the Tribunal of Inquiry, and in the course of this evidence, Mr. Phelan informed the Tribunal that in September of 1999, Mr. Lowry approached him, having identified a property in the UK which he believed had considerable potential. Mr. Phelan arranged finance to assist in this acquisition with GE Capital Woodchester Bank, and it was further agreed that a company known as Catclause Limited would be used for the purpose of acquiring the property. “We feel that it is important to point out to you that as we understand it, your office acted in the incorporation of Catclause Limited and the first directors of the company were detailed and registered as being Michael Lowry and his daughter. We emphasise this point as it has been suggested in evidence before the Tribunal that there was attempts to disguise the involvement of Mr. Lowry with the transaction. “Catclause Limited was identified to GE Capital Woodchester Bank as the acquiring mechanism, yet incredibly it appears that the bank did not see fit to make even the most basic inquiry as to the parties behind the company which would readily have identified Mr. Lowry’s involvement. In fact, I don’t know if that was the precise instruction or the tenor of your own evidence, but you did tell the Tribunal a moment ago that you had a telephone conversation with Mr. Vaughan at or around that time, in January or February of 2000, and you told him — he told you that you were out of the transaction; isn’t that right? A. What he told me confirmed the instruction that he received from Aidan Phelan, yes, which had effectively taken me out of it; Aidan Phelan had taken it over. 82 Q. “From the evidence and surrounding circumstances, it seems abundantly clear that by February of 2000, Mr. Lowry was no longer involved in the transaction and Mr. Phelan had adopted the position of personal responsibility in the matter with the bank and had informed you of the situation. “In light of this, our client is at a total loss to understand the content of your letters of the 12th July 2000 and the 5th September 2000 to Mr. Kevin Phelan. “Leaving aside the fact that there appears to be two versions of each letter in existence, we would request that you let us have a full explanation as to why reference was made in the letter of the 5th September, and we quote: ‘Michael wants to own the property in his own name for a month prior to the sale’, and furthermore, why in the letter of the 12th July one version records ‘This property was purchased in my name as trustee for Aidan Phelan’ and the other version records ‘was purchased in my name as trustee for our client’. Now, I’d suggest that nothing could have been clearer from that letter but that your solicitors were taking an extremely serious view of this matter, and they wanted Mr. Vaughan, as your solicitor in the matter up until July 2000, as your continuing solicitor in another matter, to explain himself and to explain how he could have used your name in relation to matters and transactions under his control when you were no longer involved in them. And what was also very serious was that of course evidence had been given to this Tribunal that you were no longer involved in these transactions. Your solicitor’s own view of the matter was that you were at a total loss to understand the situation, and is that your position still? 83 Q. Now, could we deal firstly with the letter of the 12th July. Initially what I’ll be referring to is the long form and short form top copies of this letter. Now, can I ask you to look at Mr. Vaughan’s letter to your solicitors in response to their letter seeking an explanation for what was contained in the second paragraph of that long form of the letter of the 12th July. The document is document number 30 in tab 1; do you have that? 84 Q. Mr. Vaughan, in that letter, in response to your solicitor’s letter, states: “I am not going to reiterate all the facts of my involvement in the acquisition of 377 Wilmslow Road, Cheadle — known as “Saint Columba’s Church” and Hilltop Farm, Chesterfield Road, Glapwell, known as the “Mansfield property”. These have previously been explained in great detail in correspondence and to the Tribunal in private session. The following issues, however, need to be put into proper context. “I was first instructed by Mr. Kevin Phelan, who was not a solicitor but an agent, on behalf of Michael Lowry, in respect of the purchase of the Mansfield property in September of 1998, and completion of the purchase of that property took place on the 18th March 1999. “I was instructed in respect of the purchase of Saint Columba’s Church in September of 1999, again by Mr. Kevin Phelan on behalf of Michael Lowry, and the completion of the purchase of that property took place in December of 1999. “As a solicitor, my practice deals with purely non-contentious matters, the vast majority of which are commercial and conveyancing transactions similar to the purchase of the Saint Columba’s Church and the Mansfield property. “The only unusual factor relating to the purchase of these two properties is that following the exchange of contracts, the solicitors acting for the vendors in both of these properties had occasion to serve notices to complete because I did not receive the completion funds on the due date. “Kevin Phelan’s intentions on both sites was to have discussions with the relevant planning authorities with a view to obtaining planning permission within the purchase process so that a sale of a particular property could be ‘back-to-back’ with the purchase in an attempt to effect a positive cash flow. “Both before and after the purchase of these two properties, my practice has dealt with other similar transactions. That seems to confirm, by the way, that he wasn’t involved in the Vineacre transaction, doesn’t it? 85 Q. “Likewise with Aidan Phelan — I had been involved in the acquisition of Doncaster Rovers Football Club, but all the negotiations relating to that transaction were conducted by Kevin Phelan, and I did not even meet Aidan Phelan until after the transaction had been completed. “The instructions relating to the purchase of the property in Luton by Beechwild Limited were again given to me by Kevin Phelan. I do not recall ever meeting Aidan Phelan in respect of this transaction, although it is clear from my file that I spoke to him about it on the telephone. “I am not currently instructed by Aidan Phelan in respect of any other matter, and although I am still the company secretary of Doncaster Rovers Football Club Limited, that company, although not dormant, is merely a holding company for the leases on the football ground upon which the club plays — I have no involvement whatsoever in the club itself. “I hope this explains the background to my involvement in the two particular conveyancing transactions in which the Tribunal are interested, namely the acquisition of Saint Columba’s Church and the Mansfield site, which I reiterate were very ordinary transactions. He says: “Although these two transactions appear to be of an enormous amount of interest to the Tribunal, so far as I am concerned (without in any way wishing to appear discourteous to the Tribunal) they were ordinary transactions representing a fairly small part of my work at that particular time. “1. Kevin Phelan acted for the purchaser of the Mansfield property and had a very close relationship with the vendor and her agent. “2. Because Kevin Phelan acted for both Aidan Phelan and Michael Lowry and was involved in other matters as well, it is very difficult when speaking with Kevin Phelan over the phone to know whom he was representing at any one time, especially as any telephone conversation could cover a number of different matters. “This certainly caused confusion on various occasions which is why there may have been more than one version of a document prepared by me because the first may have been prepared by me following a misunderstanding of my instructions. “3. There was constant pressure from Kevin Phelan to hold up exchanging contracts for the purchase of the two properties, pending him making planning inquiry and looking for new purchasers, to see if added value could be achieved on a site, with the objective of completing a purchase practically simultaneously with the completion of a sale on to a new purchaser. “4. Kevin Phelan was constantly telephoning my office, my home and my mobile telephone, putting my staff and myself under additional pressure. “5. So far as I was concerned, Michael Lowry relinquished any claim to ownership of Saint Columba’s Church in early 2000, and certainly by February of 2000. However I was well aware that Michael Lowry was honour bound to Aidan Phelan to help achieve a sale of Saint Columba’s Church. By implication, so was Kevin Phelan as Michael Lowry’s agent. “In your letter you mentioned evidence given by Aidan Phelan to the Tribunal. I cannot comment on that as I have neither seen a transcript of that evidence nor was I present at the Tribunal when it was given. “However, I confirm that I acquired on behalf of Michael Lowry at the request of his agent, Kevin Phelan, an “off the peg” company called “Catclause Limited” from Messrs. Jordans, the company agents. “Michael Lowry and his daughter were registered as officers of that company. I cannot imagine now anyone could believe that Michael Lowry was trying to disguise his involvement with this company because Companies House in England and Wales is an open, public register, and information is easily accessible to anyone. “You indicate that I have confused Aidan Phelan and Michael Lowry. This is not unexpected, bearing in mind what I have written above”. I just want to stop there for one moment, because I am going to come back to the whole letter in a minute, once I have finished reading it. But can you help me, because I can’t find any indication in Messrs. Kelly Noone’s letter which suggests that Mr. Vaughan has confused Aidan Phelan and you. Am I right in that? 86 Q. But is there anything in the Kelly Noone letter? 87 Q. Is there anything in the Kelly Noone letter — maybe I have missed it — which says “Mr. Vaughan, you have confused Aidan Phelan and Michael Lowry”? Do you understand me? 88 Q. I am asking you to agree with me, or disagree with me if you like, that there is nothing in the Kelly Noone letter to the effect that Mr. Vaughan has confused Aidan Phelan and Michael Lowry. A. But it was Mr. Vaughan, obviously, that wrote that letter, not Kelly Noone. 89 Q. I appreciate that. He is writing his own letter. In his own letter, he says “You indicate that I have confused Aidan Phelan and Michael Lowry.” You see that? A. He is obviously confused again. 90 Q. That’s not contained in the letter Kelly Noone wrote; isn’t that right? There is no statement to that effect? A. If you say so. I haven’t looked at it in that detail. 91 Q. Do you know, did you have any conversation with him about this? 92 Q. With Christopher Vaughan. 93 Q. We’ll go on to the end of the letter, if you didn’t have a conversation with him about it. We may find out how he formed that impression from somebody else. “However, I was instructed that the Revenue would expect that any site should be owned by an investor personally to minimise any Capital Gains Tax liability. Therefore the objective was correct, but the name was stated incorrectly by me. I would put this down to either a simple error or lack of concentration. Kevin Phelan complained to me over it, and I simply corrected it. “With regard to your reference to the duplicate letters as mentioned above, I regularly faxed transmissions to Kevin Phelan throughout our whole working relationship. “If he then corrected something on receipt of a fax, I would have sent him the amended version and kept that hard copy on my file, but probably not the first version of the fax. Kevin Phelan would therefore have two versions of the same letter and I would only have the final version. “I have already explained this to the Tribunal clerk, and Kevin Phelan has confirmed my view of what I think occurred. “I have been subjected to a huge amount of pressure, inquiry, discussion and speculation about these transactions from various bodies including the press. “I have also been given an equally large amount of information about situations, matters and characters of which and of whom I had no previous knowledge whatsoever, whilst the two conveyances transactions were taking place. “For example, I have still never met or spoken to Denis O’Brien or indeed had any idea of who he was prior to the Tribunal asking me for information about these two conveyancing transactions! He then goes on to deal with why he couldn’t attend the Tribunal as a witness. Now, presumably when your solicitors wrote to Mr. Vaughan seeking, as they put it, a full explanation for this, you were hoping that you’d get something which would explain two things to you: firstly, why there appeared to be two versions of these letters; and secondly, as your solicitors pointed out, something that would explain the content of the portions of the long form letters that were not in the short form letters. Would that be right? 94 Q. So when you got the letter from Mr. Vaughan, you were hoping this is going to explain everything? A. Well, obviously we were waiting for his response, yes. 95 Q. Now, can you tell me, firstly, do you regard his letter as an explanation of what happened? A. Well, if I could take it in the first instance and say to you that I was never in receipt of those letters. I was not aware of the existence of those letters. I had no knowledge of those letters until such time as they were forwarded to my solicitor by the Tribunal. I had a discussion with my solicitor, and as always, we agreed to do what the Tribunal requested us to do, which was to write to Christopher Vaughan and ask him to give an explanation. We received a lengthy response from him, and we submitted that to the Tribunal. 96 Q. But did you regard the response — which, as you say, is a very lengthy response — as containing an explanation? A. Yes, he has given, obviously, an explanation. 97 Q. Your solicitors asked for a full explanation. Can you tell me what parts of his letter contain explanations for the parts of the long form letters that we were talking about a moment ago? We were talking about the 12th July letter, and I think if we just take the portion of that letter that was mentioned by your solicitors is the part that says “You will recall that this property was purchased in my name as trustee for our client”, and that appears to be you. Can you tell me, where does Mr. Vaughan provide an explanation for how that letter came to be in existence? A. My reading of the letter is that Mr. Vaughan has explained to the best of his ability; I can’t go any further — it’s his job to explain what happened, and in my view he has made an attempt to do that. It’s not for me to judge whether or not it’s satisfactory; that is a matter for the Tribunal to make a decision on. He has put his letter to us, and we have forwarded his letter in its entirety to the Tribunal. 98 Q. Well, would you agree with me that there doesn’t seem to be anything here that specifically explains how that passage came to be in the letter, in the long form of the letter of the 5th July? A. Well, he has confirmed, which is confirmation of the evidence that has already been given to the Tribunal by a number of people, including myself, that I was out of that property transaction in January/February. He has confirmed that in his letter back to you. He has confirmed that the property was purchased in the company name of Catclause; that I was publicly a director and my daughter was a director of that company. I gave my home address, or my Abbey Road address, Thurles, as the registration for my directorship and Lorraine’s directorship of that company. And I think he makes a good point that that isn’t the act of somebody that was trying to hide something, and in references to the letters, he goes on to say that he was confused. Now, I am not happy; I am not happy that there is — that there was two versions of one letter or two letters in existence. I am not happy with it, and we communicated that to him through my solicitor, and he has given his response. And as I said, it’s a matter for the Tribunal to make a decision on that response. 99 Q. He has said to you, that you correctly pointed out, that he was quite satisfied that you were out of this transaction from early 2000, and certainly by February. All the more reason, therefore, why you would be looking to his letter to contain some explanation for a letter containing a reference to you in connection with this property in July of 2000, where that letter was written by the man who says you had nothing to do with it in July of 2000. And what I am saying to you is: Where does his letter contain any explanation to that effect? I want you to have an opportunity to point out to me where it contains something that explains that, because I can’t find anything in here that explains that. A. I have — as I said, I have no comment to make other than to say that I have done everything we possibly can to assist the Tribunal. We have written to Mr. Vaughan, we have got a lengthy reply, and that response is obviously his explanation. And I can’t force anybody to write something other than what they feel comfortable writing, and obviously he was comfortable with that response himself. 100 Q. You said a moment ago that you were not happy with this situation; isn’t that right? And I can well understand why, in light of the evidence you have given, you wouldn’t be happy; because here is a suggestion that evidence given by you about a transaction is being contradicted by documents produced by — written by your solicitor. Isn’t that right? A. And in his explanation to you, he confirms that my evidence was correct on the first day. He is saying that — first of all, can I repeat, because obviously this is important — can I say first of all, and I repeat, that I have and had no knowledge — I had no knowledge of those documents that have been put before me. I had no involvement in drawing up those documents. Those documents were not served on me or issued to me at any stage by anyone other than when they were brought to my attention by the Tribunal. When they were brought to our attention, I consulted with my solicitor, and my solicitor carried out the requests that were given him by the Tribunal. And in response to that, we got a lengthy letter from Mr. Vaughan which confirms my position on it. Now, the reference, if it is to me, I don’t know who the reference to “Michael” is, but if it is to me, if that reference is to me, it is obviously wrong, and he made a mistake. 101 Q. Do you think that’s what he is saying, that he made a mistake? A. It’s not for me — I cannot be judgmental in relation to the response that he has given. It’s a matter for the Tribunal to make a decision on that. 102 Q. You are not happy with it. Are you happy with the explanation? A. That is the correct position. 104 Q. In the teeth of that, a letter has come to light which suggests that you did have an involvement. When that letter came to light, the Tribunal brought it to your attention so that you could take whatever steps you saw fit to seek an explanation from your solicitor as to what he was doing. And your solicitor has written back to you, and I suggest that he has written back to you without an explanation. And what I want to suggest to is that the situation is now worse than it was before the Tribunal brought this matter to your attention, because your solicitor has failed to come up with an explanation. A. My solicitor in his response has confirmed a number of key points, and in fact has confirmed the evidence that I have given to this Tribunal, which is the factual position. And the factual position is that that property was purchased in the name of a company, Catclause Limited, which was openly and publicly registered in my name and my daughter’s name. He has also confirmed that when the guarantor didn’t deliver, that Aidan Phelan took over the property, took over responsibility for the loan, and that I was out of it in January or February. That’s confirmed in his response back to the Tribunal, and I gave that response to the Tribunal, and obviously that is now on the record. 105 Q. You were provided with all of the correspondence that the solicitor to the Tribunal had with Mr. Vaughan; isn’t that right? 106 Q. And that included one of Mr. Davis’ first letters to Mr. Vaughan after Mr. Davis first drew to Mr. Vaughan’s attention the existence of these documents; isn’t that right? 107 Q. If you look at document 9A, you’ll find an account of a telephone conversation between Mr. Davis and Mr. Vaughan. This is a letter of the 25th March, 2002, in file — or in leaf 1. 108 Q. In the first leaf, yeah, document 9A. CHAIRMAN: I don’t know if the screen might be easier, Mr. Lowry; I find it easier to work from. MR. HEALY: 109 Q. Do you want to follow it on the screen, do you? “Dear Mr. Vaughan, I refer to our telephone conversation of Tuesday last. 1. Your file copy of letter dated 5th September, 2000.” That is the short form office copy of that letter. 2. A copy of a letter you issued from your office on the 5th September, 2000.” And that is the long form top copy of the letter of the 5th September, 2000. 3. Your file copy of letter dated 12th July, 2000. 4. A copy of a letter you issued from your office on the 5th July, 2000. Now, I just want you to understand what point Mr. Davis was making at that stage. Mr. Davis was drawing Mr. Vaughan’s attention to the short form office copy that he had provided the Tribunal with of the letter of the 5th September. That, I think, is called document A. Then Mr. Davis was then bringing to Mr. Vaughan’s attention document C, which is the long form top copy of that letter. Do you see that? 111 Q. Now, with regard to the other two letters, he again brought to Mr. Vaughan’s attention Mr. Vaughan’s office copy of the letter of the 12th July, which was the short form of that letter, and he also gave him a photocopy of the long form of that letter, which I think is document F.
Do you follow me in relation to these documents now, so that we are not at loggerheads over them? So the explanation he got from Mr. Vaughan at that stage was the one that the long form of the letter is much longer than the short form office copy that I retained, that I probably expanded on the short form when sending a copy out to the addressee of the letter. A. That was over the telephone? 113 Q. That was over the telephone. That was the explanation that was given? 114 Q. Now, would you agree that that’s a very unusual explanation as in relation to how a solicitor would conduct his practice? 115 Q. Would you agree with that? A. I can’t speak for Mr. Vaughan or for Mr. Davis. I am not privy to that conversation. A. I am not going to comment on the conversation. 117 Q. I am going to ask you to comment on whether you think this was the type of conduct you’d have expected from your solicitor, in terms of efficiency, even. A. I have no comment to make on my solicitor’s comment to your solicitor, which is obviously a private call between both of them. 118 Q. The Tribunal is going to consider this information, Mr. Lowry, and you should have an opportunity to comment on it if you like. A. Well, I don’t wish to comment. 119 Q. You have no desire to make any comment on it? 120 Q. So you have no desire to make any comment on the fact that your solicitor issued the long form of the letter of the 12th July in a totally different form to the office copy he retained himself, according to his first explanation? A. And it was for Mr. Vaughan to give you an explanation. He feels that he has given the Tribunal an explanation in a detailed response to you, or to us. We passed that on to you. 122 Q. Well, now, that was the first explanation he gave to Mr. Davis in his letter, or in his telephone conversation. We have had no further letter from Mr. Vaughan in any way clarifying that explanation. But in the letter he wrote to you, or to your solicitors, purporting to give an explanation as to what happened, he makes no reference to this practice he may have had of changing letters when they went out to the addressees to which they were being sent. Do you notice that? A. Obviously it’s a fact. Could you go down to “With regard to your reference to the duplicate letters…” Do you see that? 124 Q. “With regard to your reference to the duplicate letters as mentioned above, I regularly faxed transmissions to Kevin Phelan throughout our whole working relationship. If he then corrected something on receipt of a fax, I would have sent him the amended version and kept that hard copy on my file, but probably not the first version of the fax. Kevin Phelan would therefore have two versions of the same letter, and I would have only the final version.” Does that seem to you to make any sense? A. That is his explanation. 125 Q. Does it make any sense to you? A. I am sure it could happen. I don’t know. I can’t comment on it, because that’s a matter for Mr. Vaughan to explain himself. 126 Q. You know that Mr. Kevin Phelan has written to the Tribunal, although he has not given evidence, saying that he doesn’t have any of the long form letters. You are aware of that from yesterday’s evidence? A. I am aware of? 127 Q. The fact that Mr. Kevin Phelan has said that he doesn’t have any copies of the long form letters; that he doesn’t, in other words, have the letters that Mr. Vaughan says he should have. A. I am not privy to that. I am sure my solicitors have got whatever correspondence is there. What he is saying is that Mr. Kevin Phelan should have the long form and the short form of each of the two letters we described a moment ago. Isn’t that what he is saying? 129 Q. Well, what Kevin Phelan has said is that he doesn’t have the long form and the short form of each of the letters; that he only has the short form. A. Is there an explanation for why he hasn’t? I don’t know. You’ll have to ask them. 130 Q. You have no comment to make on that? 131 Q. You have no comment to make on it? A. It’s possible he disposed of it at the time; I don’t know. 132 Q. Can I ask you to look at the long form again of the letter of the 12th July, document C. Mr. Vaughan says in the second paragraph “You will recall that this property was purchased in my name as trustee for our client.” Now, that’s a reference to you, isn’t that right? A. “You will recall that when the…” Which property is this? Saint Columba’s, yes. 133 Q. Cheadle. Isn’t that right? 134 Q. “You will recall that this property was purchased in my name as trustee for our client.” The Cheadle property was purchased for you; isn’t that right? A. The Cheadle property was purchased, yes, for Catclause, which I was the director and owner of, myself and my daughter. 135 Q. So what is stated in the long form is correct? 136 Q. What is stated in the long form of the 12th July, 2000, letter was correct? A. If he is saying that the property was purchased for me, yes, in Catclause, yes, that’s correct. 137 Q. So what’s contained in that letter is absolutely correct, in the long form? A. I presume so, yes. 138 Q. Well, do you agree, or don’t you agree? A. I agree that he purchased the property. 139 Q. And what he stated in the long form of the letter is absolutely correct. “You will recall that this property was purchased in my name as trustee for our client.” It was purchased for you. The vehicle you were going to use was Catclause, but it was purchased for you; isn’t that right? 140 Q. Now, can you go to the short form of that letter. Do you see the second paragraph of that letter: “You will recall that this property was purchased in my name as trustee for Aidan Phelan”? A. That’s obviously why he is asking — we are asking him to explain. 143 Q. That document was furnished to the Tribunal by Mr. Christopher Vaughan as a document which represented the true state of his file and the true state of the dealings he had in connection with this property; isn’t that right? 144 Q. But it’s wrong; it’s incorrect? A. The correct position from my perspective, irrespective of what correspondence he has given to the Tribunal, is yes, that property was purchased for me in the name of Catclause, which was registered with directors myself and Lorraine. 145 Q. What possible explanation could there be for changing the second paragraph of the long form of that letter? A. I can’t — I have no — that’s a question for Mr. Vaughan. 146 Q. I am asking you, is there any possible explanation? 147 Q. The only explanation, I’d suggest to you, is to remove a reference to you from the documentation. A. I cannot accept that. There would be absolutely no reason why that should be necessary or could be done or was done. 148 Q. One thing is absolutely clear: It was done. 149 Q. Where has he said he made a mistake in relation to that? A. Well, I think if you read the lengthy response that he gave, he is effectively saying that he got confused. 150 Q. A moment ago you said you couldn’t find the explanation, but I cannot find the part of the letter Mr. Vaughan gave you where he says that that change was made in that letter because there was a mistake. A. I am not saying that he — I don’t know — what I am saying, that in general terms he gave you a response. He is effectively saying that — I think he used the phrase, when I saw it up the last time, that he did something in error, or that he hadn’t his concentration, I don’t know, whatever his explanation is. 151 Q. Rambling all over the place but not dealing with the issues. A. Well, I can’t — we asked him for it. We put the points to him, and you have got his response, and that response is on the public record. 152 Q. He says that sometimes he would make contact with Kevin Phelan and Kevin Phelan would suggest changes in documents. Now, you might think that was an explanation for what happened here, but let’s assume that it was what he was intending to convey to you and to the Tribunal, that he would contact Kevin Phelan about some of these letters, and Kevin Phelan would say “You have made a mistake”, and then he would correct the mistake. So if he sent a letter to Kevin Phelan which would have said that “You will recall that this property was purchased in my name as trustee for our client”, meaning you, he is now asking you to believe and this Tribunal to believe that Kevin Phelan said to him, (a), that’s a mistake; sure this property was purchased for Aidan Phelan. The mistake is in the short form letter. 153 Q. Don’t you agree with me? It’s not an explanation. How could Kevin Phelan make the mistake that the property was purchased for Aidan Phelan when he knew himself, he must have known, he purchased it for you? Isn’t that right? A. He had to know that he purchased it for me because that’s the facts of the case. And if he did get confused, and if he made a mistake, I simply didn’t know about it. As I said, I wasn’t aware of this documentation until such time as you presented it to me, and I have already said that I am not happy that there is two versions of it before the Tribunal. 154 Q. And if Mr. Kevin Phelan asked Mr. Christopher Vaughan to change that paragraph, paragraph 2, and to put in the wording that is in the short form, “You will recall that this property was purchased in my name as trustee for Aidan Phelan”, he wasn’t correcting a mistake; he was stating what was an absolute falsehood. Isn’t that right? Isn’t that right? 155 Q. Is that correct or not? Was that not a falsehood? “You will recall that this property was purchased in my name as trustee for Aidan Phelan.” That was a false statement. 156 Q. I am not asking to you comment on it, Mr. Lowry. CHAIRMAN: Mr. Healy, I think he has accepted that the long form was correct and the short form was incorrect. 158 Q. Could we go on to the letter of the 5th September for a minute. Go to the second paragraph of that letter. A. This is his response to the Tribunal? 159 Q. No, the long form of the letter of the 5th September. Just go to the — it’s document F. You might find it easier if you had a hard copy, would you? A. Okay, no, I can see here. Now, that paragraph doesn’t appear in the short form of this letter. When you asked Mr. Phelan or asked Mr. Vaughan for an explanation of this, again I can’t be clear as to what part of his letter contains an explanation, but can you point me to any part of his letter that contains an explanation for that? A. The only explanation that — the only reference that I see to it is where he says he was getting instructions from Kevin Phelan, and that at times it was exceptionally confusing, and that he confused Aidan Phelan with me; I presume the “Michael” here refers to me, even though I can’t be certain. That’s the explanation that he gave, that he got confused, and that he did make mistakes arising from the confusion. That’s my understanding of his position. 161 Q. So let’s just take this one step at a time. Are you saying that he was confused in relation to the 5th July letter as well? A. I don’t know. That’s a matter for his — that’s a matter for Mr. Vaughan to make a decision. But I am saying clearly, all I can give you is my position. And I have given evidence to this Tribunal, and it may be contradictory, but effectively Christopher Vaughan has underlined and confirmed the accuracy of my original contribution here in the response that he has given. As to what happened in letters between himself and Kevin Phelan, I wasn’t in possession of those letters. They weren’t copied to me. I simply don’t know. 162 Q. Which do you think is the important part of the letter? The confirmation that you weren’t involved, or the attempt to explain the different versions and the references to you in the long form letters? 163 Q. Which is the important part of the letter to you? A. Obviously all of the letter. MR. O’DONNELL: What difference does that make to anything? This is, with respect, a pointless exercise. Mr. Healy is putting questions to Mr. Lowry on an inconsistent basis that there either is an explanation or there is not an explanation in the letter. He has to make it clear which is the case he is putting. It seems quite clear there is an explanation which he doesn’t accept. The memorandum of information that is sought from Mr. Lowry asks for information in relation to Mr. Lowry’s knowledge of these documents. Now, that evidence can be given in ten minutes. He has given his evidence in relation to that, and he is now being asked to comment on matters in relation to which he can give no evidence of knowledge. CHAIRMAN: Well, there is a balance, I think, Mr. O’Donnell, between giving Mr. Lowry — and indeed yourself — at any stage observations or questioning in an opportunity to add any further matters that may explain apparent discrepancies. I accept that there are limits to the degree to which your client should be asked to speculate on matters that he has said he was not privy to. And I think, Mr. Healy, I’ll take the view that you should be reasonably limited in the matters that you should put in this regard. But I think it’s nonetheless important, since the Tribunal may have regard to some of these matters or apparent discrepancies, that Mr. Lowry is given an opportunity to add any further matter which may clarify these apparent inconsistencies. 164 Q. MR. HEALY: At the time this letter was written, on the 5th September, the only other property Mr. Vaughan was dealing with on your behalf was Mansfield; isn’t that right? 165 Q. And that property was in fact in your own name; isn’t that right? 166 Q. This letter was clearly written by somebody who felt, or who had been instructed, that you wished to own that particular property, Cheadle, in your own name for a month prior to the sale to Thistlewood. A. It just simply doesn’t make sense. 167 Q. And you didn’t, certainly, give any instruction to that effect to Mr. Vaughan? 168 Q. And you didn’t give any instruction to Mr. Vaughan to that effect with regard to any other property; isn’t that right? 169 Q. The only other property you might have been dealing with him — the only other property you had in respect of which you’d have been giving instructions to him was Mansfield, and that was already in your own name? 170 Q. At that time, the Cheadle property was being held by Mr. Vaughan as a trustee; isn’t that right? A. I don’t — I don’t know the technical detail of it. All I know is that it was — when was this, in September? 171 Q. Yes. Of 2000. A. Yes, I was gone out of it in January/February of 2000. 172 Q. But it was being held by Mr. Vaughan. We know that from evidence, and I think you may have given some evidence in relation to this. Mr. Vaughan was the person who was holding this property at this time? A. I think that was evidence that was given by Mr. Aidan Phelan. He would have — after January/February, all I know is that the property had passed on from me to Aidan Phelan. As to what Aidan Phelan’s instructions from there on were to Christopher Vaughan, I simply don’t have access to it. 173 Q. Well, it certainly — it’s extremely unlikely that there would have been any reason for anyone to give instructions that a property was to be held in your name for a month prior to sale if you didn’t have any ownership in the property; isn’t that right? A. That’s the factual position; I did not. 174 Q. And the only basis upon which anyone might write a sentence like that, sensibly, is if you did have an ownership in the property; isn’t that right? A. Or the person who had the ownership on it, if it refers to that particular individual. Does that sentence make any sense, or — that sentence, yes — make any sense to you? A. If the “Michael” referred to is me, it is clearly wrong. 176 Q. It suggests, doesn’t it, that Mr. Vaughan is not happy about sending correspondence to you? That’s what it suggests, isn’t it? A. Mr. Vaughan should have had no reason whatsoever to have any concern about sending correspondence to me. And I think at some point or other, the only concern he had — he made the point himself in some — I don’t know which letter I read it in, but he corresponded with the Tribunal where he referred to the difficulty he had in getting access to me for correspondence because I was in Thurles, I was in Dublin, I was in different offices. And I think he made that point in the letter. I had never any difficulty with receiving correspondence from Christopher Vaughan, and I certainly have no reason to give as to why, if that comment refers to me, should be. 177 Q. What it seems to suggest is that “I get concerned about correspondence going to Michael, but instead I am sending a copy of this to Aidan” — presumably meaning Aidan Phelan — “as he needs to keep the mortgage lender happy as to the loan that Michael took out” indicating, as I see it, that he could rely on Aidan to communicate with you and to communicate with Investec Bank to keep them happy. A. At that stage, as you know from previous evidence, I was out of it, and the loan had been taken over. And it was my understanding that Christopher Vaughan should have been aware of that, but certainly the evidence and the information in the bank is to the fact that Aidan Phelan had taken responsibility for that loan at that particular stage, because I was gone since January/February, because my guarantor was gone. I couldn’t satisfy the conditions of the loan. He had taken over the loan and the bank were aware of that. My understanding is that Christopher Vaughan was aware of that, but you’ll have to ask Aidan Phelan about that. 178 Q. This paragraph does, however, suggest that the writer of the paragraph had the impression that you were involved in this transaction at this time? A. Well, if the writer was under that impression, the writer was wrong. 179 Q. And doesn’t it also suggest that if the writer was under that impression, he didn’t want the Tribunal to know that he was under that impression at that time by not giving that document to the Tribunal, or a copy of it? A. I can’t account for what Mr. Vaughan has written or said in that context. All I am saying is that if that’s the impression that’s in that letter and it refers to me, it’s a mistaken impression. 180 Q. I want to look at both letters again. I think to do this you are going to have copies in your hand; otherwise it could get confused. Could you look at the long form of the letter of the 12th July, and also the short form of the letter of the 12th July. 181 Q. Is that not correct? A. Is what not correct? 182 Q. That the long form of this letter of the 12th July was in some way a mistaken letter that was written due to a mistake or due to confusion? A. What I am saying is that Mr. Vaughan, the way I read his response is that he made errors because he was confused. Now, as to which one or the other is wrong, all I can give you is what my position is, which is the factual position. As to what way that is interpreted in letter form from Mr. Vaughan is a matter that you have to address to him, and I have assisted the Tribunal in bringing that to his attention. 183 Q. If you look at the document B, which is the short form of the letter of the 12th July, 2000, that contains the paragraph that we mentioned a moment ago: “You will recall that this property was purchased in my name as trustee for our client.” If you look at the long form, it says “Dear Kevin”; do you see that? Underneath that, it has “Re: Saint Columba’s Church”, with an apostrophe between the “A” and the “S”. Do you see that? 184 Q. If you look at the short form, “Saint Columbas Church” is spelt without the apostrophe. The typeface is bolded. Do you notice that? 185 Q. And there is no “Re” or semi-colon; do you see that? 186 Q. In fact, if you go up a little further, you will see that the long form is addressed to Mr. Kevin Phelan, 106 Gillygooley Road, with “Gillygooly” spelt G-I-L-L-Y-G-O-O-L-Y, whereas in the short form it’s spelt 106 Gillygooley Road — G-I-L-L-Y-G-O-O-L-E-Y; do you see that? 187 Q. You then go down onto the address, to where after the words “County Tyrone” in the long form, you have no space, and then two capital letters, BT, a space, the letter 72, and then a space or the figure 72, a space, the figure 5 and the letters QA; do you see that? If you look at the short form, there is a space after “County Tyrone”. Then you have BT72 without a space, a space to the figure 5QA; do you see that? 189 Q. The first sentence. On the long form, that sentence takes two lines, just as it does on the short form, but the word “only” is on the first line in the short form and on the second line in the long form; do you see that? Now, on the short form, “purchaser” is spelt with a capital P, and on the long form with a lower case P.
Then the next item is “If not, is there now a tenant in the house as discussed with you recently?” As you will see, in the long form, “tenant” has a lower-case T, and a capital T in the short form. Then you have the final paragraph, which is not in the short form. Then, on the long form, the words “Yours sincerely” are followed by a comma and seem to be centred or in the centre of the page, whereas on the short form they are on the left-hand margin. Also in the long form, the letter is signed “Christopher Vaughan”, but there is no typing of the name “Christopher Vaughan” which is contained on the left-hand margin of the short form. And it also appears that the short form may ultimately have been justified, i.e., or in other words, when finishing the typing of the letter, the typist put straight margins on both sides of the letter, and that doesn’t seem to be the case on the long form. Do you see that? 191 Q. Now, if, as Mr. Vaughan suggests, he simply made a mistake in the long form of that letter of the 12th July and was told or alerted about that mistake by Mr. Kevin Phelan, wouldn’t you just expect one simple correction and not all those differences between the two documents? A. Well, my solicitor — we have never disputed the fact that there are two different letters, and there is no mistaking that. A. And we brought that to his attention. 194 Q. It’s not just that, Mr. Lowry. You brought to his attention that there were two different letters or two versions of letters between the same parties on the same date. And he gave a response or an explanation which, on one view, might be to the effect that this happened as a result of a mistake; that some mistake was drawn to his attention, and he corrected it. What I want to suggest to you is that these letters are different in a myriad number of ways, and that if the long form letter contained your mistake, that mistake would have been taken out, and otherwise the long form letter would have been the same as the short form letter. Wouldn’t that be right? Isn’t that what you’d expect, or anybody would expect? A. Obviously what has happened here with those two letters is that the two letters were written not on the same day, and they were rewritten, for whatever reason he had. A. That’s staring everybody — I mean, nobody — we brought that to his attention. We gave him the copies of the letters and what have you, and we have his explanation. I can’t speculate as to what he did or when it happened. Maybe it was different days. He is the only person, individual, that can explain it. And we have attempted to get him to explain it, and he has sent you a long, detailed response. And I can’t comment on it any further than that. 195 Q. MR. HEALY: He sent you a long, detailed response? 196 Q. Which you made available to the Tribunal? A. That’s correct. I think he made some comment about it. 198 Q. But isn’t it also possible that if this letter is a totally different letter, in a sense that it was completely rewritten, isn’t there a possibility that it was rewritten at a much, much later time and for a totally different purpose than to correct a simple error that was drawn to the attention of the writer by Mr. Kevin Phelan? A. I can’t, I don’t — you have to put that to Mr. Vaughan. 199 Q. If that were the case, that the letter was reconstituted at a different time altogether, wouldn’t that suggest that there was a deliberate reconstitution of the letter? 200 Q. A deliberate reconstitution of the letter. A. Well, certainly if — I can’t comment on whether that happened or not, but certainly as my solicitor, he certainly would have had no instruction from me in regard to that. CHAIRMAN: Do you want to pause, Mr. Healy? MR. HEALY: Yes, Sir. Just one matter. 201 Q. When you met Mr. Vaughan, I think was it at the Regency Airport Hotel? 203 Q. In Aidan Phelan’s office, sorry. That was prior to that date; isn’t that right? 204 Q. On the 15th March? 205 Q. Did Mr. Vaughan have his file with him? 206 Q. At that meeting. A. I didn’t have a meeting with Mr. Vaughan. What happened at that particular meeting, I have given evidence to this effect already, that I received a telephone call from Aidan Phelan to say that a problem with the bank, Investec, had been brought to his attention; that the matter was going to be referred, he thought at that stage, to the Tribunal. And I couldn’t understand how — my reaction was, that’s impossible; what has this to do with the Tribunal? And he told me he’d be in the office that evening. I called to see him in the office that evening, and at that particular stage, I met him privately, and he told me that there was a problem with the bank and that arising from that, that he was in the process of making a statement to the Tribunal in response to whatever communication he had from the bank — or the Central Bank; I don’t know which of them it was — and Christopher Vaughan was there at that particular time, but I didn’t have any meeting with Christopher Vaughan at that stage. What — they got on, or Aidan Phelan and Christopher Vaughan were obviously preparing themselves for their response to the Tribunal. 208 Q. Was he in the room with you at the same time? A. No, I just met him as I was there. 210 Q. I see. You had a meeting with him, I think, on the 16th in the Regency Airport Hotel? A. That’s correct, yes. That is correct. 211 Q. I think I may have misled you; it wasn’t the day after you had the meeting in the Regency Airport Hotel? A. It was a week later. A. It was actually more, I think. 214 Q. We can get the correct date. Mr. Vaughan was present at that meeting. Mr. O’Connor, your accountant, was present? 215 Q. You were present?
. 216 Q. Ms. Helen Malone was present? 217 Q. And Mr. Aidan Phelan was present; isn’t that correct? 218 Q. Did Mr. Vaughan have his file at that meeting? A. I don’t think he had a file. Well, he had something with him. I don’t know whether he had a file, whether it was a full file or not, but he certainly had documentation with him, yes. CHAIRMAN: We will pause for lunch. Just while it’s still in my mind, Mr. Lowry, taking the 12th July letters, both in the — I think we have agreed, though none of us are secretarial or typing experts, that it clearly appears to be a separate and different typing occasion. Just at the start of the second paragraph in both the short and the long form, you will note that it says “You will recall that this property was purchased in my name as trustee”, but in fact there is, in both the short and the long form, there is the same rather silly typing error. You see that there is a capital “I” instead of what obviously should have been a small “in”, so it seems that — it would seem unlikely to be coincidence. It seems that the same typing error was duplicated on the other typing undertaking. Does that seem to be the case? A. Yes, I would say, yeah. CHAIRMAN: Very good. We’ll take up the conclusion of your evidence at two o’clock. Thanks, Mr. Lowry.